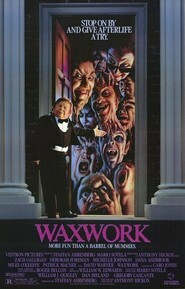 Wealthy slacker college student Mark, his new girlfriend Sarah, and their friends are invited to a special showing at a mysterious wax museum which displays 18 of the most evil men of all time. After his ex-girlfriend and another friend disapear, Mark becomes suspicous. What he doesn't know is that they have been made a part of the exhibit, by first living out the scene and then being murdered in.